Poor Charlie Sheen. When he first started losing his mind, I honestly thought it was a publicity stunt. I've always been a fan of his show, 2 1/2 Men, so I thought it was a little funny. But as the days wore on, and he got crazier and crazier, I'm now convinced he's having some sort of mental breakdown, and my thoughts and prayers are with his family. This drama from a social media perspective has been incredible. He started Tweeting on March 1st, and he already has around 1.5M followers. Two of his most famous quotes involve something about "winning" and "tiger blood," and both become internet memes in just a matter of hours. 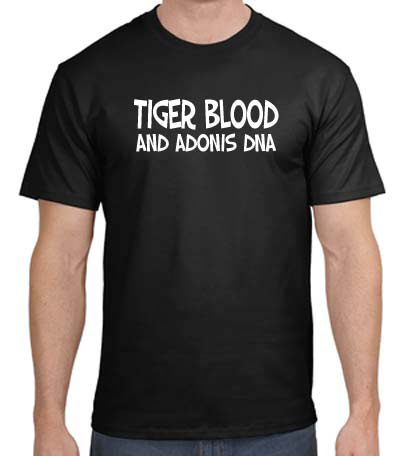 Now every blogger, internet marketer, retailer and blood donation organization has found a way to incorporate #tigerblood into their daily tweets. Yes, yes, I know, Charlie Sheen's irresponsibility is a problem - culturally, morally, and logically. There is no justification for it. But just as appalling is the feeding frenzy occurring over his dying public repuation. As I've been typing this last paragraph, there were over 1000 tweets posted using the above hashtag. I've used it a couple of times today, myself, and understand that it's hard to resist. I just wonder if Charlie has become a self-filing prophesy, by allowing others to feel they're #winning as he spirals and suffers in his own private torment? Thanks, Charlie, for the years of laughs, as well as for letting us laugh "with" you even in the darkest times. Please get the help you need to take care of yourself and your family. We need you around to make us laugh for years to come. Jennifer Pointer is in Tulsa, OK. She promotes a simple, a low-tech approach to effective online profile management, search engine optimization and social networking.